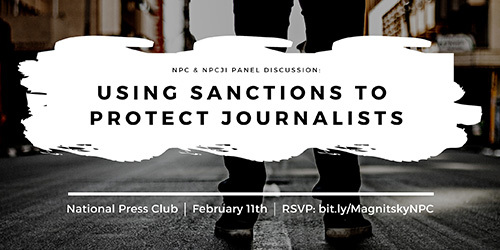 Lawmakers, former senior State Department officials and journalists will gather at the National Press Club on Feb. 11 for a discussion about the growing use of human rights sanctions to protect journalists around the world. The panel discussion “Using Sanctions to Protect Journalists” will take place from 1:30 p.m. - 3:00 p.m. in the club's Murrow Room. The event is open to the public. Registration is required and can be completed below. Named after the deceased anti-corruption Russian lawyer, Sergei Magnitsky, the first human rights sanction laws were passed in 2012 and 2016. The U.S. has imposed sanctions for human rights violations before (such as on Saddam Hussein for his use of chemical weapons) but Magnitsky appears to be the first law to include journalists as a protected class of workers that human rights sanctions can be imposed upon if they are targeted for their work. ● The strategy behind press freedom sanctions: punishment, deterrent, both? The Club, founded in 1908 and based in Washington, D.C., is the world’s leading professional organization for journalists. Through its Press Freedom Committee, the Club defends transparency and free expression around the world. The National Press Club Journalism Institute promotes press freedom worldwide, provides professional development, and offers scholarships to aspiring journalists.